Please, send me more information about ref DM3956-04 in Los Flamingos, Benahavis or similar properties. Los Flamingos, the luxury residential zone situated roughly midway between Estepona and Marbella. 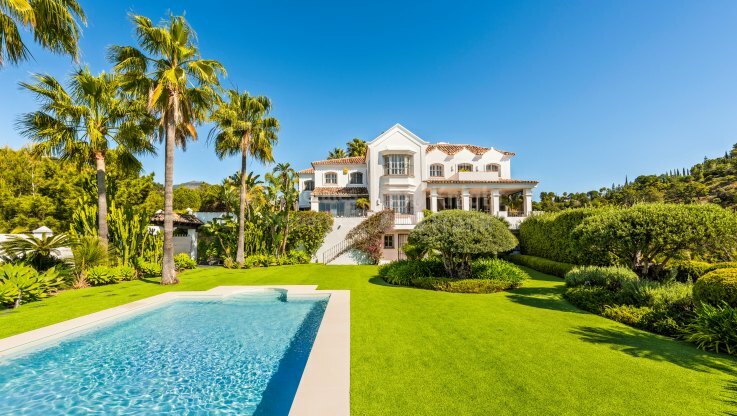 Though just a few kilometres from the shoreline and beach clubs of the area, Los Flamingos is a country estate made up of a verdant valley surrounded by mountain scenery and fantastic sea views all the way to Gibraltar. Though it is a peaceful, stylish gated community of attractive contemporary villas and apartments, Los Flamingos also stands out for the unique quality of its on-site amenities, all of which give added value to owning a property and living here. At the heart of these is the Los Flamingos Golf Club, a beautifully designed 18-hole course known for its softly undulating Tuscan-inspired fairways and greens. This cosy property situated at approximately 2.5kms from the beach and 20 kms from Marbella and 10 from Estepona is sold fully furnished and features on the ground level an entrance hall with cupboards, guest toilet and lovely staircase, a spacious lounge with dining area, classical kitchen with modern finishings equipped with MIele appliances, a massive covered terrace with stairs to the swimming pool and a large garden, one guest bedroom with bathroom and exit to the terrace. The upper level with three bedrooms where the master bedroom has private dressing room, marble bathroom and large private terrace with sea views. Two other bedrooms have small balconies and private marble bathrooms. The basement features large garage for 3 cars, 2 storage rooms, one of which can be used as a gymnasium o games room, a laundry and a staff bedroom with shower room and independent entrance door.